Mike Isabella is one of the Top Chefs on Bravo TVs series of the same name. Isabella owns Graffiato, a restaurant that opened in June 2011 in Washington DC. That is where Peter Roof was asked to record a cooking demonstration now featured on California Walnut’s website. 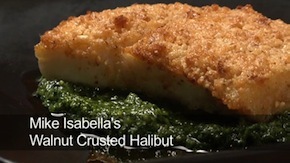 The featured recipe was a crusted halibut filet with arugula pesto. Two Panasonic HPX170 cameras were used to cover the demo. When complete, a turntable was used to slowly turn the delicious dish in front of the camera. Watch the finished 2:51 clip here.